I feel like it has been quite some time since I have seen a really a good sci-fi flick, it feels like it’s been ages. However Snowpiercer is one movie that I won’t be forgetting anytime soon; it is one damn good movie. The film is based on a comic by Jean-Marc Rochette, called Le Transperceneige. The story is set in the near future where most of civilization has been wiped out due to an experiment gone wrong. The experiment is of course an ambitious albeit a little scary, one as scientists try to counteract global warming. But things go wrong and what was supposed to save the world causes an ice age. Because it wiped out most of humanity, the only people left alive are the ones who are onboard a train (Snowpiercer) that loops around the world once every year. The train is truly not a happy place to live on, unless perhaps you lived closer to the front; but for those that are stuck in the rear section of Snowpiercer, life is anything but great. Snowpiercer is broken up into different sections that deal with class, while the people at the front of the train live a life of luxury, people at the back are pretty much like refugees, working like slaves, and eating the… umm… not so healthiest of meals. The story follows Curtis (Chris Evans), as he leads a rebellion against his oppressors. His mission? Battle is his way from the back to the front of the train and to confront the ‘boss’ (Ed Harris). This kind of sounds like a video game. The atmosphere of the movie is absolutely great, it’s dark and gritty and downright disturbing. The action scenes were intense and violent with a few characters meeting their fate when you least expect it, which is always a good surprise. Chris Evans’ transformation into Curtis made me forget all about the fact that he is Captain America especially with his disturbing little revelation towards the end of the film. The Korean actors that made up the father/daughter drug addict duo did a pretty good job, with Song Kang-ho playing the role of a scientist, and Go Ah-sung as his very fragile and disturbed daughter; they help Curtis make his way through the train by unlocking doors in exchange for drugs. 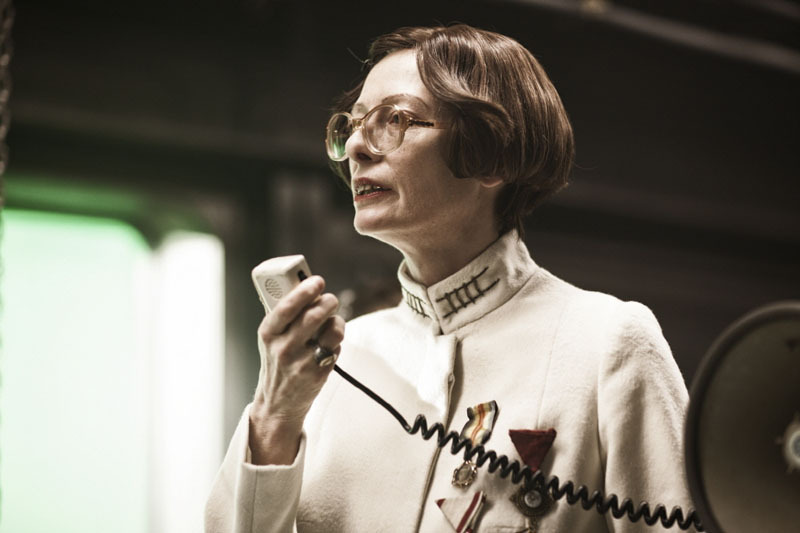 The real stand out star in this movie, though, was Tilda Swinton, as her bumbling character Mason. I was never sure whether to like her or just hate her. She was the person pretty much in charge of the rear section, and once Curtis took her hostage, her attempts at escape were downright amusing to watch. Although Swinton’s character was phenomenal, the real attraction was this massively long train. It’s almost crazy to believe that it still follows societal class structure, with the rich staying rich and the poor staying poor. I would have thought everyone would have been in the same conditions with the onset of the apocalypse, but I guess some things never change. 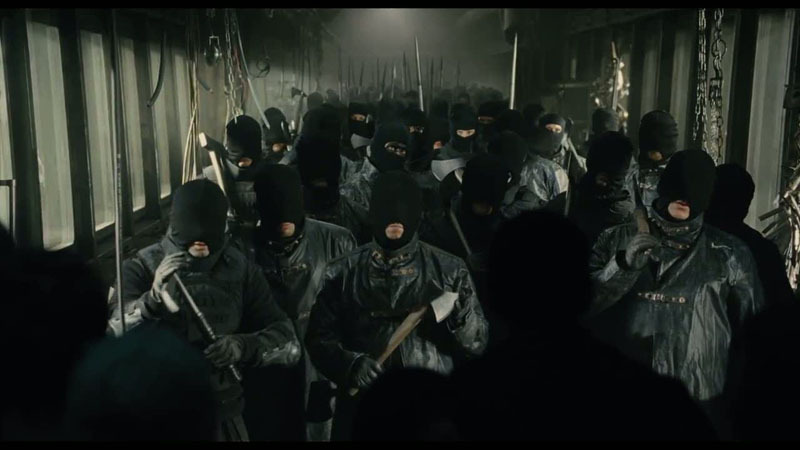 Snowpiercer was an intense thrill ride from beginning to end; a train filled up with some extremely kooky characters. This is definitely not your typical Hollywood film (it is a South Korean-American production), this isn’t a movie chock full of dazzling special effects and hundred million dollar budgets. I am happy that this film came to North America. It is one that I think will truly surprise people. Director Boon Joon-Ho gives us a film with a great artistic approach and an intensity that little Hollywood films can do nowadays even with millions of dollars at their disposal. I honestly think that Hollywood should take some notes from this film.